I have long held the position that statists wish to supplant the church and its influence in the lives of people with its own authority, and to do so, the institutional left seeks to displace religion from the lives of Americans because this will enable them to pour government into the vacuum. The latest controversy over the Obamacare mandates on religious institutions to provide contraception coverage in their health care insurance policies was thought to be just another ill-considered political decision from which the Obama administration would ultimately retreat. That retreat has been only rhetorical as Obama’s dictatorial policy remains in place. This isn’t political ineptitude, but statists’ calculations: The Obama administration knows that this attack on the Catholic church and Christianity generally will result in the wholesale elimination of religiously-oriented institutions. That’s what they’re after, and that’s what they’ll get, as the seek to push people even further from religion in order to make more room for the growth of an aggressive and overpowering state. Secularize itself, breaking its connection to the church, her moral and social teachings and the oversight of its ministry by the local bishop. This is a form of theft. It means the church will not be permitted to have an institutional voice in public life. Pay exorbitant annual fines to avoid paying for insurance policies that cover abortifacient drugs, artificial contraception and sterilization. This is not economically sustainable. Sell the institution to a non-Catholic group or to a local government. This is telling, and you can already see the hand-writing on the wall. The Catholic church will not be able to take steps 1 or 2, so they will instead be compelled to follow steps 3 or 4. What will that accomplish? Simply put, it will demolish their employees, their institutions, and will further serve to separate Catholics from their church. This is not accidental, but instead a long-sought goal of the institutional left that has been seeking to drive all religion out of our society. This move will force a retreat of the church into the physical buildings that bear the same description. The truth is that the church, any church, is not a matter of buildings. It is as large and widespread as its adherents, and this is the secret to what the Obama administration and his thugs of the left are really after: They will confine the church to church grounds, but force the church out of the public sphere altogether. 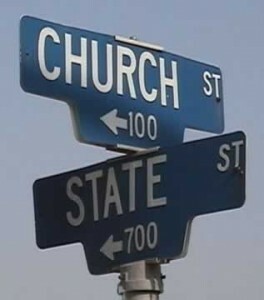 Whether you’re a Catholic, or a member of any other faith, you’ve just been served notice that your church is no longer welcome in the public square except on conditions to be established, enforced, and dictated by government. When you consider what the Cardinal is saying, its importance must not be ignored. He’s issuing you a warning, but he’s also telling you the resolution. The government is doing this. Who runs the government? You do. You have it in your power to stop this. You can stop this in November. You can stop this by refusing. You can. You can stop this with a vote. If you’re not Catholic, you’re not exempt from any of this, or the effect it will have on your church, mosque, synagogue or temple. There are no exemptions, because if the Obama administration can successfully drive the Catholic church out, by the far the single largest religious institution in the country, with as many as one in six hospital beds in the country under its umbrella, what will your relatively less influential institution of faith do in response? How will you hold back the government? Here in the Bible belt of Texas, there are relatively fewer Catholics, but there is a vast diversity of small churches with tiny congregations that are all under threat by this move against religion. As people of faith, you had better understand that this isn’t a war on the Catholic church isn’t due to an anti-Catholic bias, but instead a war on all religion as an obstacle to the supremacy of the state. The institutional left isn’t out to slap the Catholic church in a political move for the sake of some radical, loud-mouthed supporters as has been supposed. They are taking steps to chase churches out of the public square, the private sphere, and eventually out of existence. This is the purpose, and if you blind yourself with the faulty notion that this is about Catholics, or about contraception, you’re setting yourself up for slavery, because whereas churches must solicit donations from you to support their various social causes, the government will instead only demand payment at gunpoint. There will be no choice, and there will be no conscience but that which they dictate it to be. I was born and raised in the Catholic Church and I understand its teachings, but I cannot accept this outrageous proposition by Pope Benedict for a new Central World Bank. In my view, he can take his statist proposition and burn with it in the lake of fire. This is a sinful proposal, because it arrogantly ignores that which the church teaches about free will. One of the things about which I have long been at odds with the Catholic Church has been its preaching of “social justice” via social policies of governments. This perhaps applies salve to those who feel some guilt in what wealth they have earned, but more frequently, it provides a moral escape hatch for those who produce nothing while demanding that others pay their way. This is the source of a great rift in the church, greater even than questions over issues of abortion, homosexuality, and pedophilia among priests. This is a matter of what the church teaches its people at a fundamental level, and Pope Benedict’s proposal is one that should cause mortal shame in the Vatican. That institution has been collecting and sitting on vast wealth for nearly the entire period of its existence, and the fact that it wants so-called “social justice” at the point of a gun is the last piece you need to understand how morally bankrupt the Church has become. In the days of John Paul II’s early years, he fought with Ronald Reagan and Margaret Thatcher against the tyranny of communism. For me, the Catholic Church is now officially dead, because through this proposal, Pope Benedict XVI is joining the church in Communism. There are no good works one can accomplish if one practices evil in order to carry them out. This proposition on the part of the Pope is something that must be confronted, and I intend to do so. There is a reason the Church has lost credibility, and when you see that they have extended into the world of politics and governance to the extent this proposal portends, you can know that the institution of the Church is in serious trouble. So desperate is the Church to fill its coffers from the world’s poor that it now relies upon a proposal to enslave them. 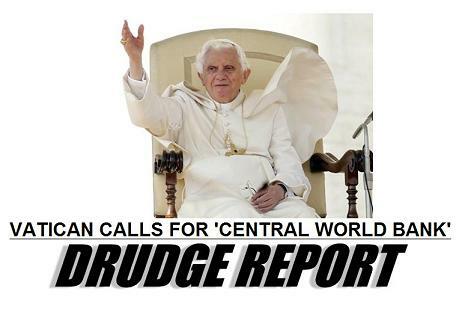 In this instance, the Vatican is actually demanding global taxes on financial transactions. WHAT? Here you have the ultimate in hypocrisy: An institution that has hoarded the wealth of ages while continuing to collect wealth from even the poorest of its flock actually bothers to address the question of “collective greed?” What can be more greedy than a Church hierarchy that occupies a palace in a nation established for its own propagation and preservation? What? What is greater greed than this? Pope Benedict should be ashamed to attach his name to any of this, and indeed, Catholics should recoil in horror. Here is the ugly reality of the nature of these actions by the Church: It is now collaborating with the devils of socialism and communism. The most disturbing part of this proposal by the Vatican was the appeal for a “Global Authority.” Yes, the Vatican just asked for a one-world government to oversee currency, banking, and apparently, taxation. I will never submit to this, and I hereby denounce the Vatican, this Pope, and all the hypocrisies for which they have chosen to stand. The church and the Pope are supposed to be spiritual leaders, but this is direct involvement in the lives of all men through government’s tentacles, and it’s an astonishing rejection of the pursuit of liberty Pope John Paul II had undertaken in the 1980s. My complaint here is not with Catholics, but with the institution that claims to lead them. This proposal is not born of the teachings of Jesus Christ, but of foolish old men in the Vatican who have forgotten what it is they are to do, and have become too comfortable in their museum-like surroundings. The Vatican is no longer the seat of the greatest Christian church on the planet, but a jewel-encrusted mausoleum that has entombed its principles beneath a stone lid of politics and corruption. Once, the Catholic Church stood against tyranny, but as we now see all too clearly, the Vatican has gotten in bed with it.